I don't know about you, but I feel as though my entire outlook on life has been brightened by the wonderful weather that we've been having! The warm sun makes me a very happy woman! As you know, our yard has become our project. We've worked for countless hours on the thing, and it still looks pretty yucky. I think that I mentioned it before, but the previous owners of our home were in financial trouble, so you can imagine that a beautiful yard was the least of their worries. We knew when we bought the house that it needed redemption. We were prepared for the work and the time that it would require. As spring arrived, I started getting the itch to plant and grow things. There is something so rewarding about caring for things and watching them grow. On my first day of planting, I planted several berry plants - blueberries, blackberries, raspberries, and strawberries. You see, I spend a small fortune on berries at the grocery store each week. I LOVE them, and they are good for the body! In order to cut costs and try out my green thumb, I decided to grow them. We'll see how they turn out. I'm not expecting a huge crop this year. Anyway, back to the yard. You get the point. We purchased the yard for a great price, knowing that it was going to be lots of work. But, in the end, it will be a beautiful masterpiece. It occurred to me this morning that this is exactly what Christ has done for me. I know that I've told you that I'm studying the gospels right now. I started on Matthew last week. I'm amazed at Christ's love for me. He bought me at a great price - His life. He knew that I was a sinner. Romans 5:8 says, "But God demonstrates his own love for us in this: While we were still sinners, Christ died for us." In the end, I will be made into a new creation. 2 Corinthians 5:17 says, "Therefore, if anyone is in Christ, he is a new creation; the old has gone, the new has come!" So, why does this matter? How does this affect my life today? This spurs humility in me. I can't tell you how many days I have set out to accomplish my own agenda, asking God to bless it. On far fewer occasions, I have asked God to give me His agenda, that I might be a blessing to it. Today, my goal is to live a life worthy of Christ's sacrifice. How sad it would be if we sold our house, never changing the way that it looks. We would've spent so much to receive so little. I don't want this to be true for my eternal purpose. I want Christ to see me as worthy of his sacrifice. Great thoughtful post. You are such a beautiful person. Thanks for blogging and sharing your thoughts with us. Wow at first I thought those were your blueberries already! My days always go better when I start them by acknowledging I'm not the one in charge, and then holding my plans/ideas in open hands ... flexing with His plans for my day. You are so able to relate what is going on in your life at this moment to what God has told us in His Word. Thank you for sharing even your deepest thoughts. 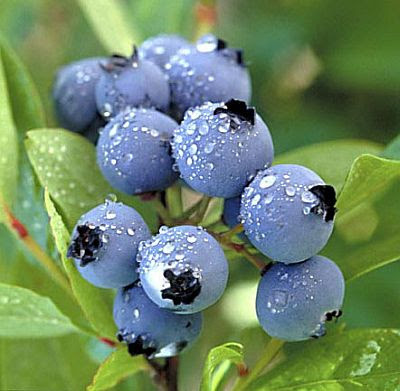 Looking forward to hearing about the growth of your berries. Personally, I have a brown thumb and live in an apartment so I truly enjoy seeing the beauty of God's handiwork in nature.